I've spent most of my adult life as a graphic designer, and have freelanced as a concept artist for various independent projects over the years, and this has instilled a desire to express myself in many ways. I've been moonlighting, of late, as a designer for a local knife-maker, and I was recently inspired to design my own ranger knife. 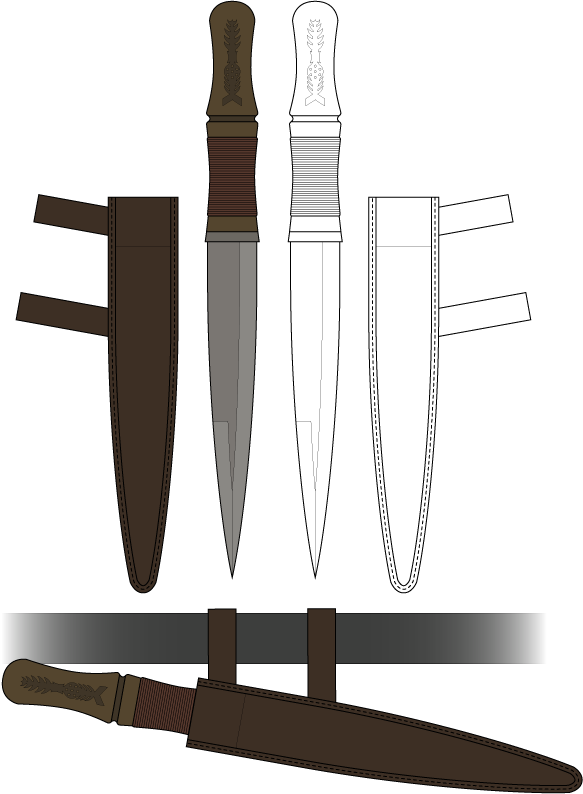 My ancestry is predominantly Scots-Irish and Cherokee, and I wanted to put that into a knife which seemed partway between a Native American war knife, Scottish Dirk, and Irish Scian. The symbol on the handle is an old Anglo-Saxon symbol used to ward off evil- as one of my great passions is studying Early-Middle Age Europe, I found it fitting. As always, thoughts and commentary of a constructive variety are not only welcome, but encouraged. I'm still learning, so by all means, help me along. Welcome and very interesting design. Nice dagger style with the false edge twist, I like it ! The wrapped front of the handle to provide a more secure grip, very well thought out. Sheaths and scabbard are not my strong suit, not at all. Leather is pretty new to me. I'll do a bit more reference hunting and see what I can come up with, though, for sure. I think that works better for a sheath, having peeked at a few other options. It's simpler but works better. 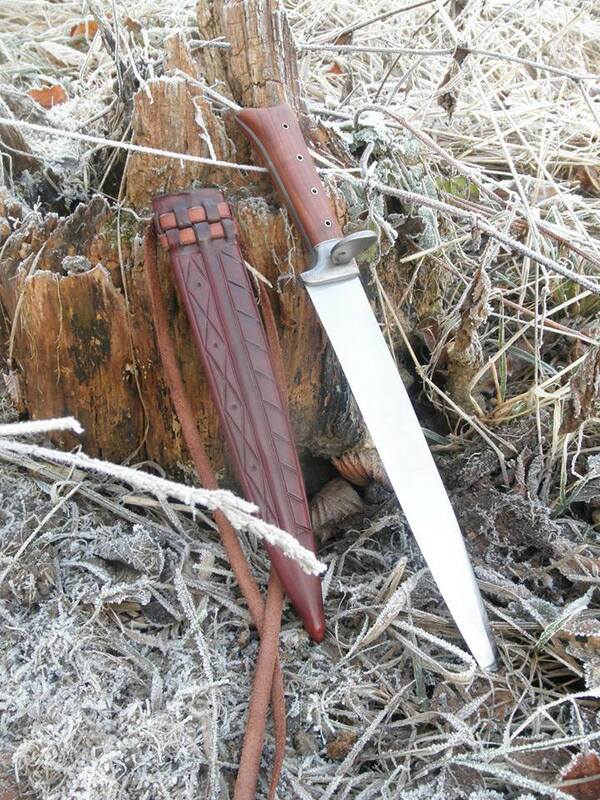 Pixelpen wrote: I think that works better for a sheath, having peeked at a few other options. It's simpler but works better. Well one of my best friends is a knifemaker, and I have experience with working with wood, so I would absolutely love to, but money is a concern at the moment, and he has a list of commissions queued up first. Eventually, I very much hope so. It's the goal. Can you tell us more about the design on the handle you mention? I'm curious to learn more about it. I like the center-ring cut in the handle as well - it's a lovely look. I could imagine a thick spine like the early ballock daggers Tod Cutler replicates might go nicely with that handle design as well - and make a wonderful compact working knife! *IF* you care (and I'm not saying you should) - I don't think that kind of sandwich-constructed sheath comes in until fairly late. 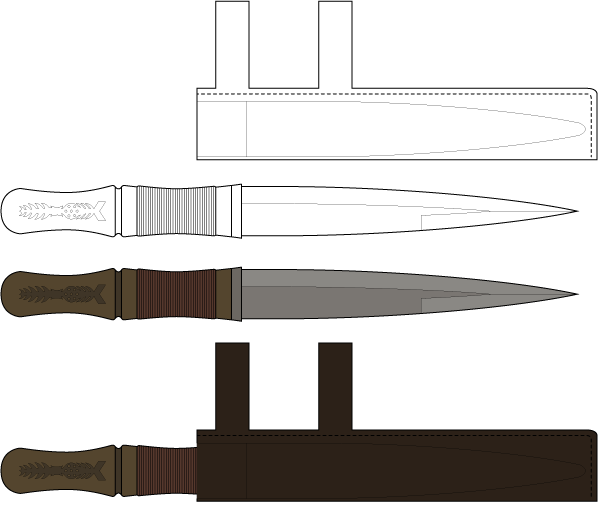 Given the way you want to hang it, I think a broadly seax-like sheath might work well, especially if you're already using a Saxon motif on the handle. Elleth wrote: *IF* you care (and I'm not saying you should) - I don't think that kind of sandwich-constructed sheath comes in until fairly late. Given the way you want to hang it, I think a broadly seax-like sheath might work well, especially if you're already using a Saxon motif on the handle. Oh but see I do care! For me, the greatest challenge as a designer is that careful balance between form and function. To say that a single element exists only for aesthetic reason isn't enough for me. There has to be a point to it, it has to stand for something. ESPECIALLY in regards to weapons of the Middle Ages. These were difficult crafts to achieve, resources weren't as easy to come by in those days and everything was done by hand, very carefully. For that reason, EVERY element must have a point for that much effort- and often money- to be poured into it's making. So, to say that a "sandwich sheath" will do because it's simply easy to assemble just... won't do at all. If you have any reference suggestions, by all means I'm all ears! ...er... eyes? All eyes? I dunno. I'm paying attention. ... I think they're a little out of place for the Dunedain of Middle-earth, but that's just my eye. The Professor might well disagree: the more of real Saxon culture I study, the more of it I see in Eriador, so... maybe? aaannd... shoot. I can't find that thread at the moment. I'm sure searching for his posts will turn up pictures. .. those are my two pennies worth. edit - one more thing. 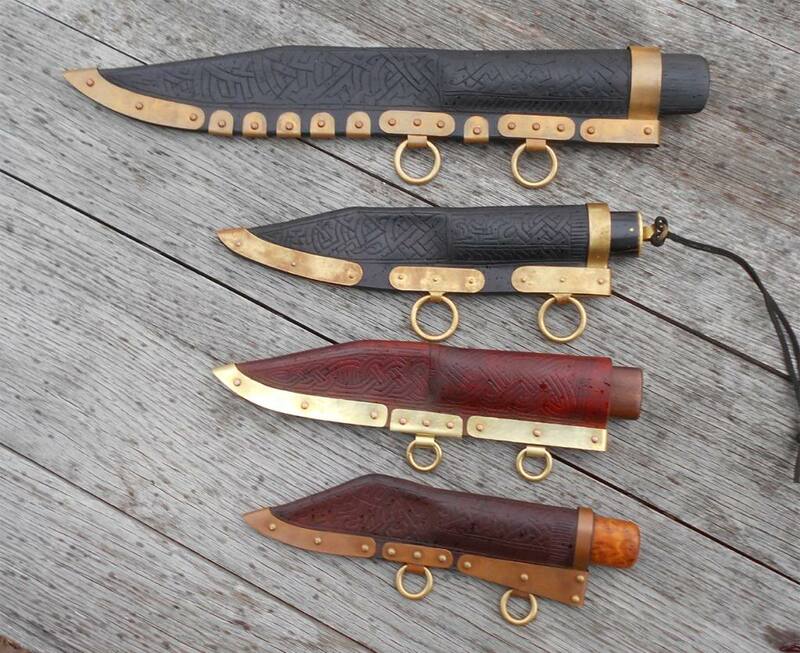 I've seen a few people do those seax-style sheaths with the brass parts replaced with bone, wood, or iron. That both reduces light reflection, and can be an awesome look in its own right. Anyhow, food for pondering.